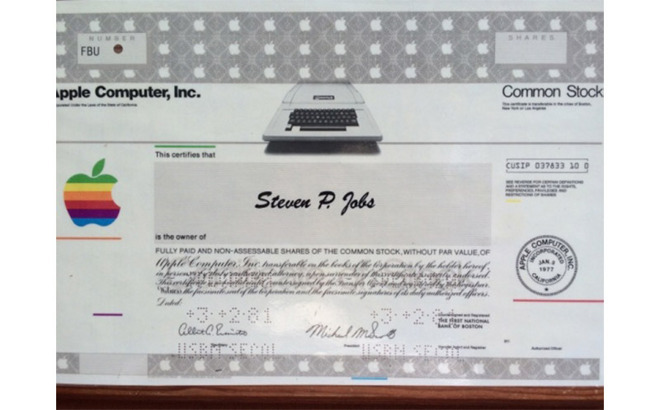 An Apple stock certificate thought to be the first awarded to company cofounder Steve Jobs, and later recovered from a trash heap, is being sold by an autograph and rare documents dealer for $195,000. On sale now at Moments in Time, the certificate appears to have been issued to Jobs shortly after Apple went public in 1980, as evidenced by a 1981 date perforated into the document, reports Silicon Beat. According to Moments in Time's Gary Zimet, the common stock certificate hung on Jobs' office wall in Cupertino, Calif., until 1985. At the time, then-CEO John Sculley —brought in to run Apple in 1983 —famously helped force Jobs out of the company. As told by Zimet, shortly after the ouster in 1985, Sculley called for Jobs' office to be cleared out. The certificate on sale today was dumped in the trash along with other paraphernalia, but an industrious employee recovered the document and kept it for 31 years. After a series of missteps that nearly bankrupted Apple, Jobs was ultimately brought back into the fold through the 1997 acquisition of NeXT. Once again at the helm of the company he cofounded, Jobs cultivated development of a series of popular products like iMac, iPhone and iPad, leading Apple to become the world's most valuable company. In giving up the important piece of Apple lore, the unnamed employee has provided a notarized letter attesting to the document's authenticity, the publication said. Beyond the letter, there is little else to corroborate Zimet's story. Apple artifacts, especially items linked to Jobs, often sell for sky-high prices. In 2011, a batch of documents that included an original founding document signed by Jobs, Steve Wozniak and Ronald Wayne sold for $1.6 million. Zimet priced the stock certificate at $195,000 based in part on those previous sales.